Earlier this year as part of a work trip to Copenhagen I cycled around on a hire bike and got to understand a little of what makes the city work as a great place to cycle. The first thing you notice about Copenhagen is that there are people cycling everywhere. For those reading this in Cambridge it is a whole other level beyond what we have in Cambridge. Based on what I saw I have come up with four potential things we could change in the UK. These are personal observations, not based on a scientific review of evidence, and so should be read accordingly. Before I list all the good things I noticed I first want to note something which was far from good. There is a huge number of cars in Copenhagen. The part of the city I was staying in was dominated by wide boulevards full of cars. This can’t be good for air pollution. I didn’t see a single electric car amongst the thousands. What is interesting is that a huge number of cyclists manage to co-exist with this traffic. They do this largely by having wide segregated cycle lanes on both sides of every large road. For any city which wants large number of cyclists this must be priority number one. The cycle lanes in Copenhagen are usually easily wide enough for two bikes side by side and often wide enough for an individual cyclist to overtake a cargo bike. There are so many things which make cycling in Copenhagen easier. On the infrastructure side that includes there being lots and lots of cycle parking across the city and other little, presumably relatively cheap touches, like bins next to cycle lanes and foot rests at some traffic lights, apparently so you don’t have to put your foot down if it’s cold and snowy! – locks built into the bikes. These are quick to use but might be a concern in places with greater risk of theft. – kick stands allowing the bike to be easily left standing up pretty much anywhere. – pedal braking, whereby trying to back pedal activates the brakes. This is great because it allows you to keep you hands free for doing other things, important things like signalling or nice things like holding your breakfast as you rush late to work. It’s a bit hard to explain. These cyclists are halfway through process of turning left from road on far side of picture! There were a couple of things which I thought we could usefully use in the UK, which I wasn’t familiar with before my trip. 1) In addition to signally left or right as we do in the UK, people also signal when they are going to stop to those behind with a raised forearm and flat hand, palm forward. This means you don’t have to awkwardly look round. You just put your hand up. 2) They have an ingenious way of turning across a main road at a crossroads. In the UK when cycling on the left, if you are approaching a crossroads with traffic lights you’d probably have to pull to the right, perhaps between a row of cars going straight on and a row of cars turning right. Instead what they do is this. As they approach the lights, they stay on the side of the road they are on, rather than moving to cross the road to turn they stay by the curb. When the lights go green to move off they start moving, with the other bikes going straight on, but instead they move to then cycle over to the front of the stationary traffic and bikes waiting to go in the direction they want to travel, putting their hand up to signal they are stopping to those behind them, and pull over in front of those waiting for the lights to change. When the lights change allowing the traffic from their new position to go they head off straight on, which is of course now in the direction they want to go. This is tricky to explain but works really well. I don’t know why we don’t do it in the UK. It would seem so much better than putting painted cycle lanes between rows of cars. 3) The final behaviour ‘rule’ was explained to me by a colleague who has lived in Copenhagen. There is a simple hierarchy which determines who gives way to whom. Pedestrians have priority. Cyclists give way to pedestrians. Cars give way to cyclists and pedestrians. This is important as it seems to be widely understood. It was noticeable when people streamed on and off bus stops at floating bus stops and when cyclists went straight on at junctions with cars waiting to turn across them. Again this is a simple behavioural rule which would make life much much simpler for all involved. Dedicated cycling campaigners will probably be familiar with everything I’ve talked about above. Quite rightly the focus has been on trying to get more investment in segregated cycle lanes. This does seem to be the game changer we need to get more people cycling. My trip to Copenhagen suggests to me that there are also smaller things which could potentially help develop a stronger cycling culture in the UK; smaller bits of infrastructure, availability of different bikes and learning additional behaviours for city cycling. Children’s cycle training track in local park complete with traffic lights. One final image, which I wanted to share because it was really impressive to see, is of a cycling training track for children with traffic lights, mini roads and cycle lanes. They start learning about urban cycling from a young age in Copenhagen. Copenhagen is definitely a nice place to visit and I’m sure a nice place to live as well. The success of their cycling has more to do with persistence and ubiquity than any particular technical merits, I think. I had the opportunity to observe some newly laid out streets and it is remarkable to see how consistent and standard it is the way cycle lanes are incorporated into basic design, even though I would not consider them to be “protected” lanes. There is something to be said for keeping it simple and predictable, even if not perfect. Having said that I noticed you didn’t mention junction design in your blog, and that is really something that Copenhagen falls down on, I think. 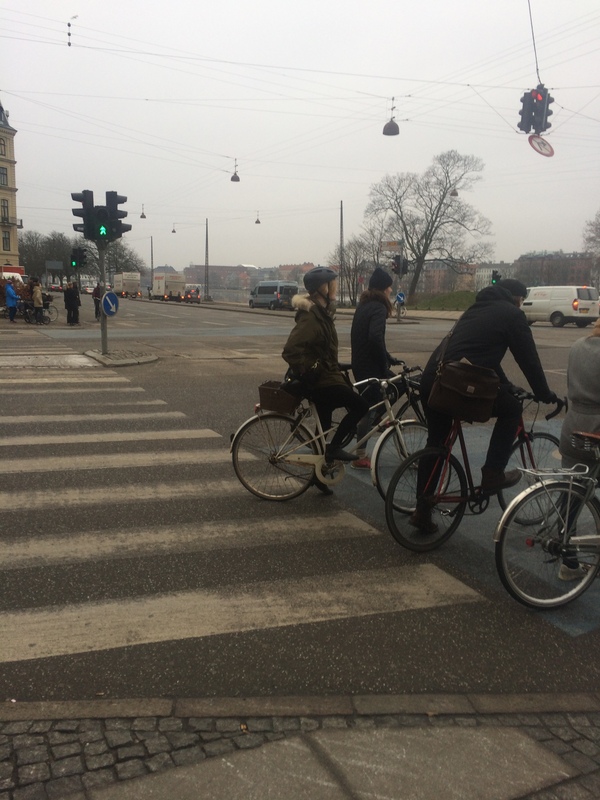 As you cycled through Copenhagen you probably noticed that in many cases the stepped cycle track ends at junctions and (a) dumps you in the right-turn lane, (b) dumps you in the general traffic lane, (c) has a separate bike-signal phase. Of the three, only (c) is really safe, the other two are rather terrifying except for the fact that Danish drivers are all trained to be aware of cycles on the right. I think that it’s rather telling that across the Øresund in Malmö, they also have a very strong cycling culture, but the infrastructure is a completely different style that copies the Dutch rather than their neighbouring city. It is definitely worth the 40 minute train ride across the marvellous bridge to see it, next time you are there. (1) I would say that Cambridge of all places in the UK has the largest proportion of upright cycles (and assorted cargo cycles) and is the most ‘Copenhagen-style’ or ‘Dutch-style’ in this regard. Although it can be a bit challenging to find such bikes at a typical UK retailer, if you look around at the second-hand market there are a few people who sell second-hand Dutch or Danish bikes here and they seem to do well (I just had 3 friends buy such bikes last weekend, for example). (2) The ‘Copenhagen left-turn’ that you describe is quite common here as well, if not so formalised. We tend to call it a ‘two-stage right-turn’ and I usually resort to it at larger junctions, depending on the circumstance. Luckily Cambridge does not have so many large junctions as Copenhagen does. The Dutch also have incorporated such turns into their cycle infrastructure, but they tend to do more elaborate layouts and have worked also to eliminate ‘two-stage’ turns from modern signalised designs. Where ‘two-stage’ is necessary, the signal phases often rotate in such a fashion that the two stages can be conducted in a smooth & seamless fashion because by the time you arrive at the corner the signals have already changed! (3) The Hills Road cycle lanes are supposed to be ‘Danish inspired’ albeit there is no steep kerb between the cycle lane and the carriageway, so it does not have the same feeling of separation that you get in Copenhagen. And it’s not ‘protected’ by any kind of verge or spacing, so it doesn’t feel separated so much. 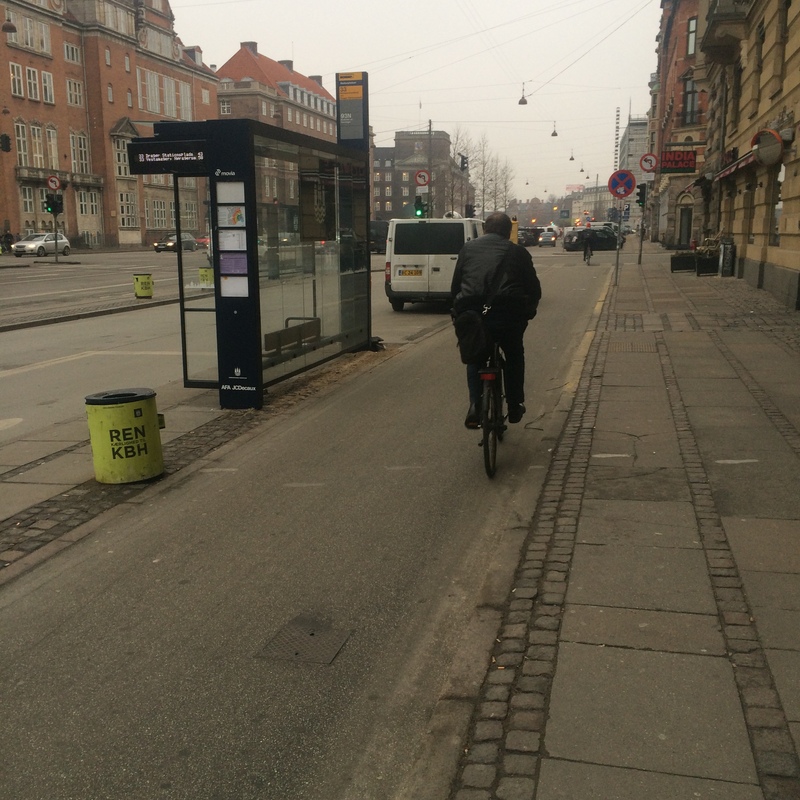 (4) In Copenhagen the stepped cycle tracks often doubled as bus stops and parked car door zones, so that created unnecessary conflict and potential danger that I feel is not something I would really want to see copied. The Danish way around the problem seems to be just ‘make it wider’ and let people sort it out, and I guess that works for them. (5) The cycle parking is abundant (although still insufficient) in both the Netherlands and Copenhagen but it is not very good cycle parking, mainly what we call ‘wheel-benders’ and other things that grasp the front wheel and do not allow you to truly secure your cycle by the frame. People there seem comfortable with the frame-locks that secure the rear wheel but nothing else, but I imagine that theft is a problem (someone could drive around with a box truck and load up bikes by the dozens). We try to push for a higher standard of cycle parking that makes it much more difficult for thieves to steal bikes if used correctly. All in all it is a good learning experience and a fun time. 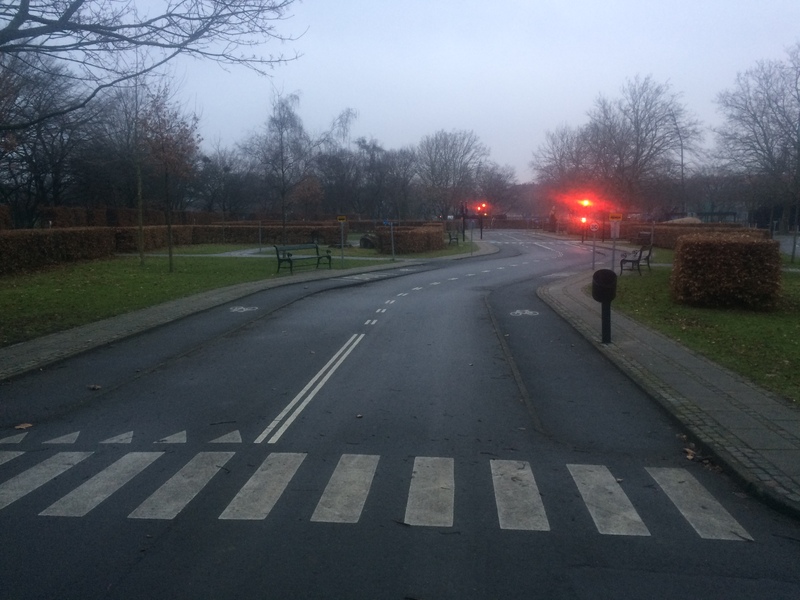 I don’t know if you were able to get out and about more but I noticed that Copenhagen has been working on threading off-street cycling parkways throughout the outer neighbourhoods, and many of those were quite pleasant (albeit the junctions on main roads were not always so wonderful). Thanks for this comment. Really helpful. I’m sure you are right that Copenhagen could still improve a lot. I perhaps presented it too uncritically. If I go back I will try to make it over to Malmo and to some of the other neighbourhoods in Copenhagen. ← Is 1.5 degrees the right message for climate action?